One of the easiest ways to learn your way around the fretboard is by applying licks to each scale position. You take something you already know how to play and apply it to the different positions on the fretboard. Sometimes it may take a few adjustments to get the lick to work, but that’s ok. It’s still a simple process. 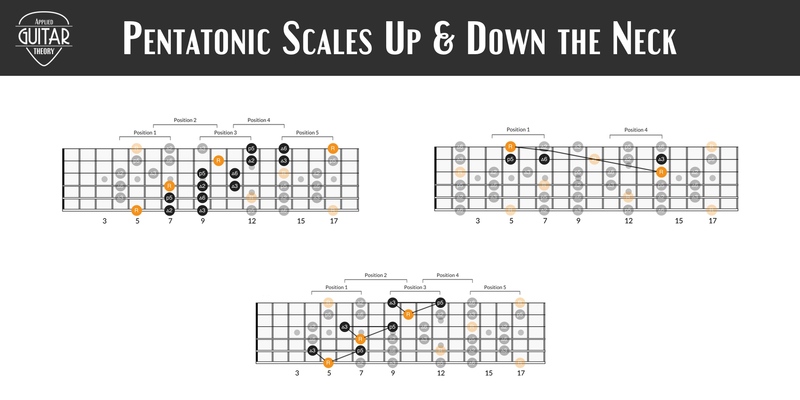 Let’s take a look at some examples using the minor pentatonic scale shapes. 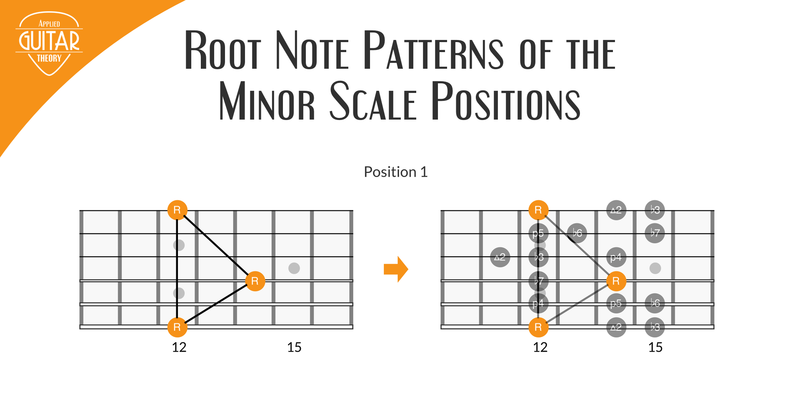 If we look at the A minor pentatonic scale laid out on the entire fretboard, we can see that these 5 notes (intervals) occur over and over again up and down the fretboard. It means that any given lick is not confined to any single position on the fretboard, but instead can be played anywhere on the fretboard. 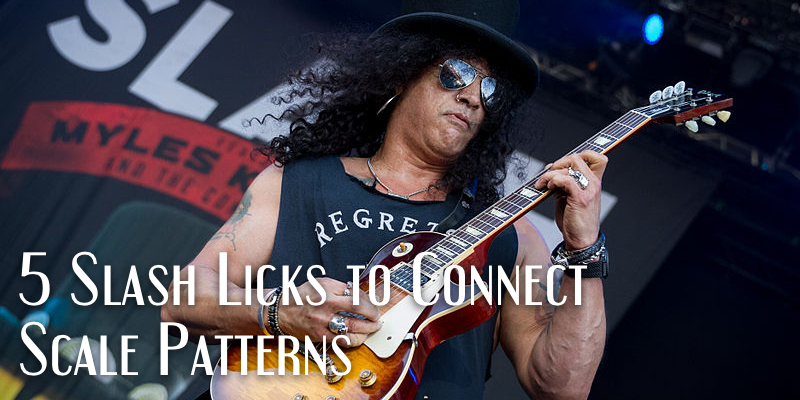 If we take a look at the notes from this lick and apply them to the A minor pentatonic scale, you’ll see that this lick is played using position 1 of the scale. But as you saw in the first fretboard diagram, these notes exist all over the fretboard. So, let’s take a look at how we can adapt this lick all over the neck. In the second position of the scale, we can play the lick using the 2nd, 3rd, and 4th strings. You’ll notice with this position we can do a pull-off between the 4th and 5th notes of the lick. However, we can adapt the pull-off a little earlier using the 3rd and 4th notes. In position three, the lick is played exactly the same as it is in the first position, only moved over to the 3rd, 4th, and 5th strings. When played in the fourth position, the lick again can be played in the original style using the 1st, 2nd, and 3rd strings. Once again in the fifth position the lick can be played in its original style using the 4th, 5th, and 6th strings. You may have noticed that in any given position there are opportunities to play the lick in a different way. The examples only show one, but feel free to adapt it however you like. This will only help your familiarity with the fretboard. Learning and applying licks to each scale position is an easy way to learn the guitar fretboard. It helps you see the connection between the notes and positions up and down the neck. Over time it gives you the freedom to play any lick anywhere on the fretboard as opposed to feeling locked into a single position on the neck. Take licks that you already know and begin applying them to different positions. Be sure to work with both major and minor scales. Start with small licks and build to more complex licks and runs.